Any team or freelancer working with projects and clients needs a reliable project management app to keep all that work in order. But, with a variety of project management apps with various features and project templates available, how do you know which one to choose? To help you with your choice, here’s a complete guide to 7 best project management tools, compared: Todoist, Trello, Asana, JIRA, Basecamp, ClickUp, and Teamwork. 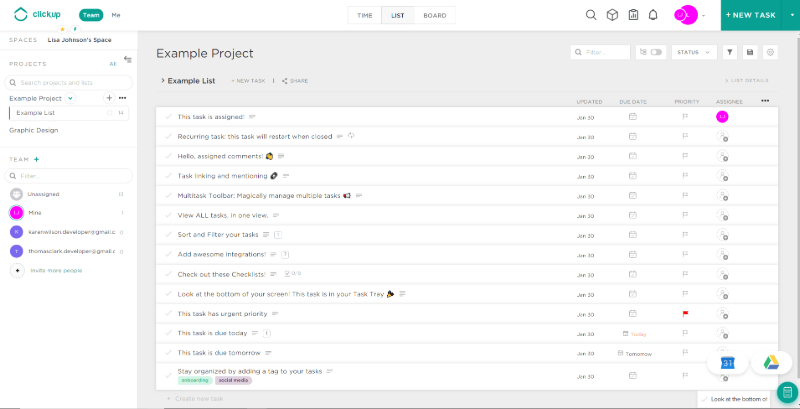 Todoist is essentially a task management app with project and team features that make it perfect for collaboration and project management. The Basic plan is free, and it offers access to all available devices, for 5 users and 80 active projects, as well as SSL secured connection, recurring due dates, sub-tasks, sub-projects, and 4 levels of task priorities. The Premium plan, available at $3 per user, per month (billed annually), offers all features from the Basic plan for 25 users and 300 active projects, but also labels, reminders, adding tasks via email, productivity charts, project templates, iCal synchronization, and more. The Business plan, available at $5 per user, per month, per user (billed annually), offers all features from the Basic and Premium plan for 50 users and 500 active projects, but also centralized team billing, easy team management, priority support, and log-in tracking. In the end, who’s it for? 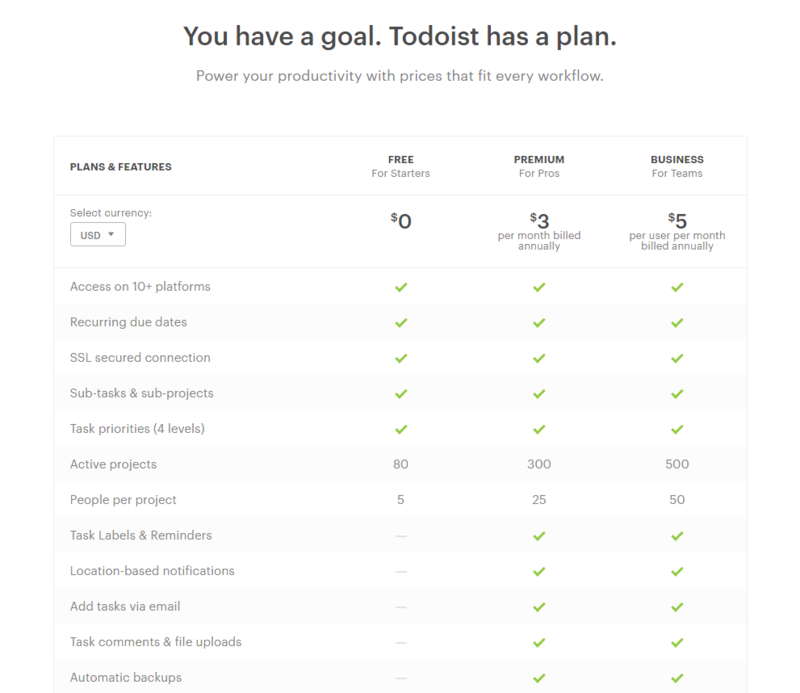 Todoist is suitable for individuals teams of any size looking for an affordable app that places emphasis on handling tasks within project management. You can easily track time in your Todoist to-dos by using Clockify extensions for Chrome and Firefox. The Free plan offers unlimited boards (projects), cards (tasks), checklists, attachments up to 10MB, to unlimited users, as well as one power-up integration per board, and linking files from Google Drive, DropBox, and OneDrive. The Business class plan, available at $9,99 per user, per month (when billed annually), offers all the Free plan features, but also unlimited power-up integrations, team overviews, custom board backgrounds, priority support, file attachments up to 250MB, and more. The Enterprise plan, available at $20,83 per user, per month (when billed annually), offers all the Free plan and Business class plan features, but also extra authentication and encryption to keep data secure, personalized assistance, and priority phone and email support. In the end, who’s it for? Trello is suitable for freelancers and teams of any size who value an interactive drag & drop interface, with basic project management features. Asana combines the list layout of Todoist and the board layout of Trello and offers you with both a drag & drop board layout and a to-do list layout, as well as a Calendar view that shows all your projects and tasks by days. The Basic version of Asana for up to 15 users offers list, board, and calendar views of projects, due dates, assignees, and status updates. The Premium Plan, available at $9,99 per user, per month (when billed annually), offers all the Basic features, but also timelines, custom fields, task dependencies, and other features. 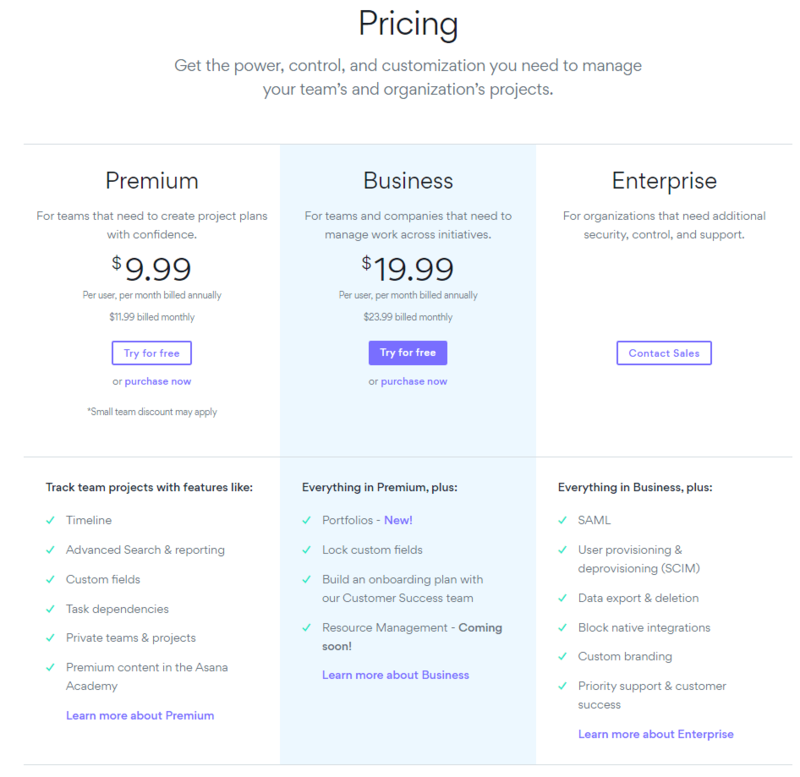 The Business Plan, available at $19,99 per user, per month (when billed annually) offers all the Basic and Business features, but also the option to create Portfolios, lock custom fields, and more. The Enterprise Plan offers everything from the previous plans, as well as data exporting options, priority support from Asana’s team, customizations options, and more. In the end, who’s it for? Asana is suitable for teams who prefer to keep their work on the go, keep track of their to-dos, track their progress with tasks and projects, as well as keep on eye on deadlines. JIRA is a robust Agile project management system with several Project Template boards and various issue tracking features. No strictly Free Plan is available, but there’s a free trial for the cloud version of the app where you can try out JIRA for free for 7 days. Another free trial is available for the server version of the app where you can try out JIRA’s cloud features (and additional server features) for free for 30 days. 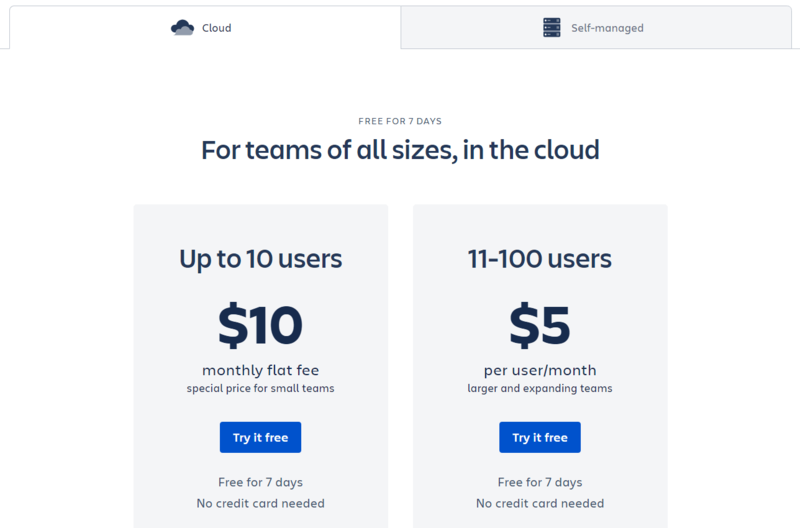 Cloud: up to 10 users $10/month (flat), 11+ users $7/user/month. Server: offers single server deployment, and complete control of the JIRA environment for a one-time payment of 10$ for 10 users, and the pricing goes progressively higher as the number of users grows ($2,500 for 25 users, $8,300 for 100 users, etc.) There’s also the self-managed Data Center plan, which also serves as an upgrade to the cloud plans, offers SAML 2.0 support, disaster recovery features, archived projects, and optimization for Azure deployment. In the end, who’s it for? Teams who want an app where they’ll be able to tackle a number of different types of projects, and especially software development teams. Basecamp is a project management tool that offers an easy system to manage your departments, teams, and projects, as well as schedule and track your and other team member’s activities. If you’re a student or teacher, you can sign up for a free Basecamp account, and there are discounts for non-profit organizations, but no traditional Free Plan. 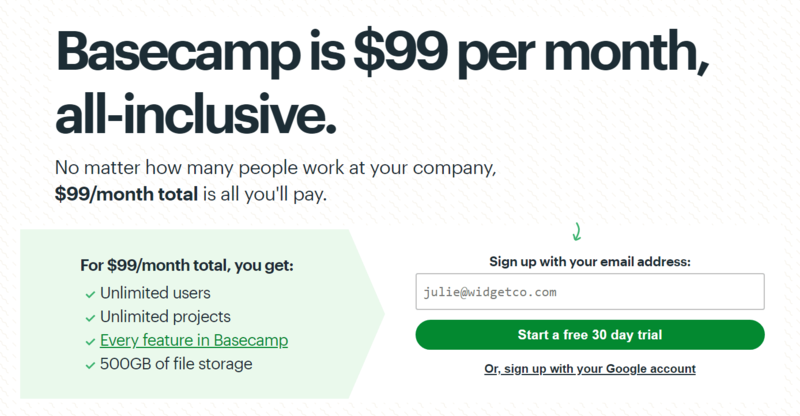 You can, however, try out Basecamp for 30 days, for free. Basecamp offers its features for a flat fee of $99 per month for your team, and you can then streamline your project management through messaging, real-time chats, to-do lists, schedules, and other options. The price of the paying plan is always fixed no matter the number of people and projects – which is great for large organizations and teams. Not a great option for small teams, as you pay $99 per month no matter whether you have 5 of 500 team members. In the end, who’s it for? Basecamp is suitable for large teams and organizations, who can benefit from its flat fee that doesn’t account for the number of users. Also, teams who work with clients and need to consult with clients on a regular basis. You can easily track time in your Basecamp to-dos by using Clockify extensions for Chrome and Firefox. 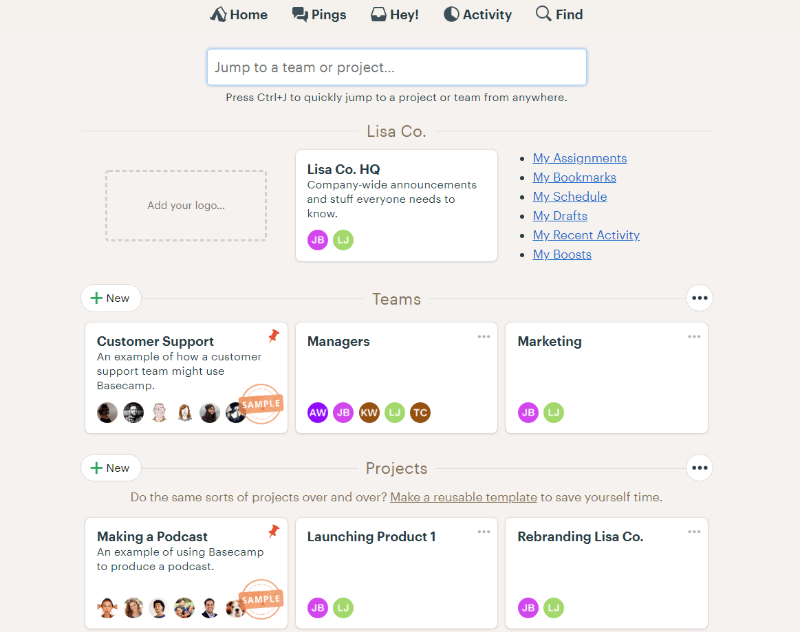 Clickup is a project management app with various customizable features, Kanban and List boards for your assignments, and team and singular Calendar views where you can track your projects and tasks by days. The Free Plan offers 100MB of free storage for unlimited users, projects, and spaces, but with limitations to a 100 uses of certain features, such as custom fields. The unlimited plan, available at $5 per user, per month (when billed annually), offers unlimited storage and integrations, as well as unlimited use of features, cloud storage, advanced reporting features, and unlimited custom fields, among other features. You can also add 5 free guests and use Gantt charts. 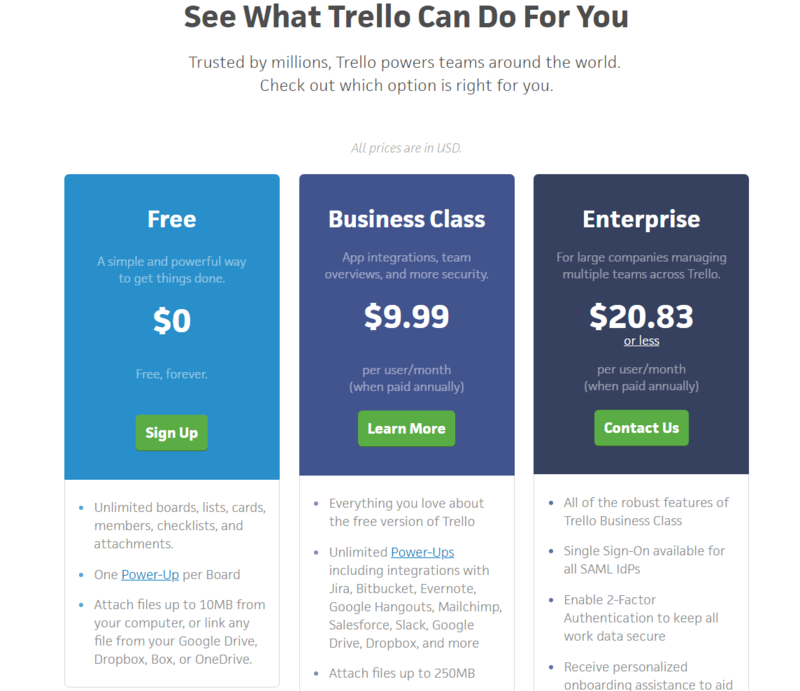 The business plan, available at $9 per user, per month (when billed annually), offers Google SSO, authentication features, and add 10 free guests. In the end, who’s it for? Clickup is suitable for teams who value customized and customizable project management features, and want to streamline a project management app to fit their needs to a T.
You can easily track time in your ClickUp tasks by using Clockify extensions for Chrome and Firefox. Teamwork Projects is a project management app with a large number of project management features, for both the team and the clients. The Free Forever plan offers 100MB space for files, 2 active projects, a limited selection for task boards, basic project management features, color themes, and subtasks. 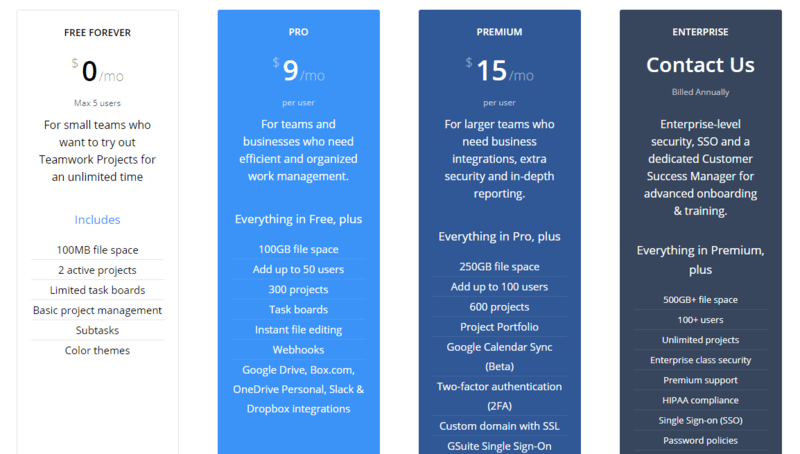 The Pro plan for a minimum of 5 users, available at $9 per user, per month, offers everything you get in the free plan, but also 100GB space for files, 50 users, 300 active projects, webhooks, select integrations, and more. The Premium Plan, for a minimum of 5 users, available at $15 per user, per month, offers everything you get in the Pro plan, but also 250GB space for files, 100 users, 600 active projects, project portfolio, SSO, authentication options, and select integrations, among other options. The Enterprise Plan, available after contact with the Teamwork team and billed annually, offers everything you get in the Premium plan, but also more than 500 GB space for files, more than 100 users, unlimited projects, Premium support, HIPPA compliance, and extra security features. In the end, who’s it for? Teamwork Projects is suitable for mid to large teams who value a wide variety of features and universal project templates, for variable types of projects. You can easily track time in your Teamwork tasks by using Clockify extensions for Chrome and Firefox. Which project management tools should you use? 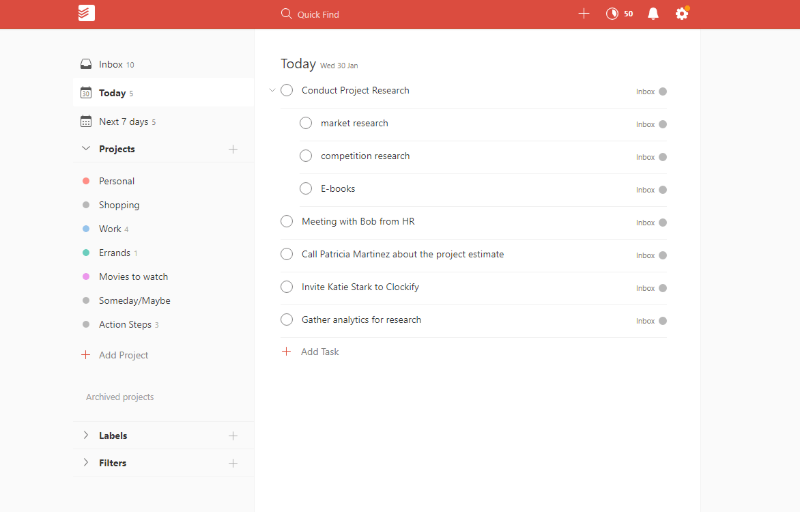 Todoist offers project and task management features, with a list approach to your tasks. It’s the most affordable entry on the list, although it’s not the richest option in terms of features. Trello offers all basic project management features for free, with a drag & drop Kanban approach meant to help you track your project progress. You may never need to switch to a paying plan, but you also may have some difficulties tracking down your tasks within the search options of the app. 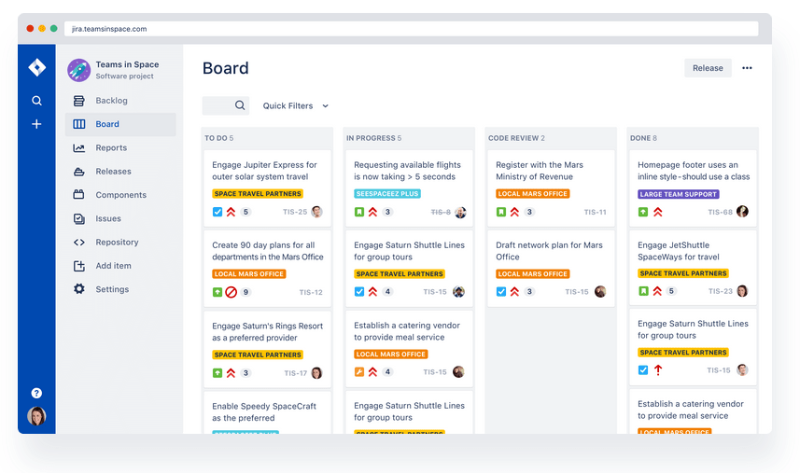 Asana offers a larger number of project management features, as well as the pick between a Kanban and List layout – so, if you’re not satisfied with Todoist having only a list layout, and Trello only having a Kanban layout, Asana is your pick. Asana also offers a Calendar view, but you won’t be able to enjoy these features in a desktop app. JIRA offers a robust agile project management system, with variable Project Templates you can choose from. You won’t get a classical Kanban approach with you kanban boards, but a Software development team will appreciate JIRA’s approach to issue tracking. Basecamp offers basic, but effective project management features, though a fixed fee of $99 per month will probably discourage small teams. Larger teams, however, will appreciate the user-friendly interface and simple features that lets them easily manage projects. ClickUp offers a generous free plan with unlimited projects and users, as well as many customizable features that will draw in teams of all sized. You’ll get the option to assign and track multiple users for one task, though the number of features will discourage users looking for a basic approach to project management. Teamwork offers a universal project template fit for a number of different project types. You’ll get basic and simple project management features, though teams looking for more specific features will probably consider another solution. In the end, your choice of a project management app depends on your needs – these factors include the size of your team, whether you want basic project management features, or a variety of features, the devices you use, the type of projects you’ll be working on, the task and team options you’ll need, as well as your expected price/features ratio.